^ Di Gregorio, Mario A. (2005). "1: Young Haeckel". 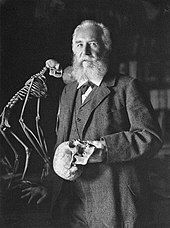 From Here to Eternity: Ernst Haeckel and Scientific Faith. Religion, Theologie Und Naturwissenschaft/Religion, Theology, And Natural Science. 3. Goettingen: Vandenhoeck & Ruprecht. p. 26. ISBN 9783525569726. Retrieved 25 March 2019. On 16 February 1834 a son was born to Charlotte and Carl Gottlob Haeckel in Kanal 24a (later Yorkstrasse 7), Potsdam, Prussia. His name was Ernst Heinrich Phillip August, and he was destined to become one of the most influential and controversial thinkers of his time. ^ Felden, Emil (1914). "Felden Pastor an St. Martini Bremen" [Pastor of St. Martini Church, Bremen, Germany]. In Schmidt, Heinrich (ed.). 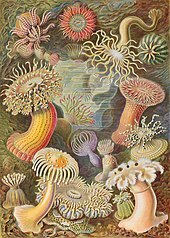 Was wir Ernst Haeckel Verdanken (What We Owe to Ernst Haeckel): Ein Buch der Verehrung und Dankbarkeit (in German). 2. Deutscher Monistenbund. Leipzig: Verlag Unesma. pp. 125–128. 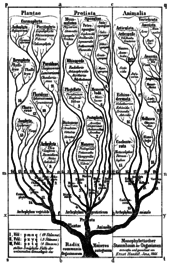 testimony of Emil Felden in Was wir Ernst Haeckel Verdanken, vol. ii, p. 125. This page was last edited on 18 April 2019, at 14:42 (UTC).